A sharp increase in deaths linked to opioid addiction in Minnesota and especially in Native communities is triggering alarm throughout the state and triggering action on several fronts. Minnesota tribes have stepped up health services and recovery programs at reservation communities and in the urban Twin Cities. State, local and tribal governments are involved in several lawsuits against pharmaceutical manufacturers accused of promoting the opioid crisis. And Gov. Tim Walz has proposed a state budget includings several items that would help tribes and agencies combat the crisis. These actions are backed up by a Minnesota Department of Health report issued in late March showing 422 Minnesotans died from an opioid overdose and 783 Minnesotans died by suicide in 2017. That is a 640 percent increase in opioid deaths and a 79 percent increase in suicides since 1999 when the Health department began its current tracking of causes of death. Health officials and substance abuse counselors know that overdose deaths, suicides and deaths from alcohol-related causes are linked. Exactly how, and determining which deaths were intentional or accidental, involve complexities of mental health and social behavior that experts are still working on defining, said Melissa Heinen, an epidemiologist and project director in the Injury and Violence Prevention Section at the Health Department. It has long been known that Native communities across the U.S. states are disproportionately impacted by drug addiction, alcohol-related deaths and suicides. That is definitely the case in Minnesota, said Richard Latterner, a manager and chemical health counselor at the White Earth Urban Substance Abuse Program, 1730 Clifton Place, in Minneapolis. “I know when I wake up God will have work for me this day,” he said. This is a national epidemic and an urgent crisis for Native communities. In recent court documents, for instance, four Dakota and Lakota tribes in South Dakota cite statistics showing American Indians and Native Alaskans account for 28 percent of U.S. opioid use disorder patients – or patients being treated for opioid use. Amidst such alarming data, the Fond du Lac Band of Lake Superior Chippewa opened a Tagwii Recovery Center at 2020 Bloomington Ave. S. in Minneapolis within the past year offering outpatient recovery services for Natives in the metro area. This is the third chemical recovery and behavioral health services center operated by the band. Fond du Lac has a Tagwii Recovery Center to help members with addition problems at its home base at Cloquet. In 2016 it greatly expanded its Center for American Indian Resources in Duluth for such services. There are numerous treatment and behavior health programs scattered around the Twin Cities. The Native community in the Twin Cities has three major programs, offering culturally structured substance abuse and chemical dependency services. In addition to White Earth and Fond du Lac centers, the Native American Community Clinic (NACC), 1213 E. Franklin Ave. in Minneapolis, offers culturally sensitive treatment programs for patients and their families. The Indian Health Board of Minneapolis, 1315 E. 24th St., is currently doing an assessment of programs and services and is exploring what it will offer for chemical dependency treatment for its Native patients, said Donavan Begay, IHB communications specialist. Similar, focused programs are offered at and near Minnesota’s 11 tribal communities. “I am really proud of what the tribes are doing, at home and here in the metro area. But there is so much work to do,” Latterner said. That was evident when the Health Department issued its report on 2017 deaths from opioids, alcohol and suicides. 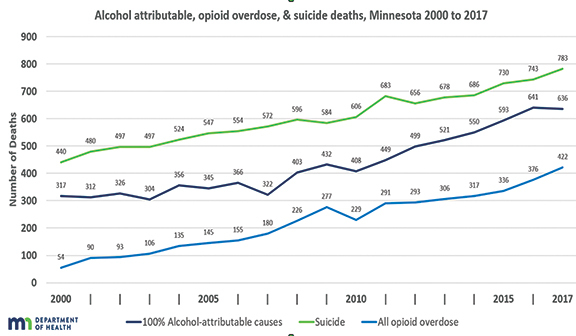 “There are many forces driving this increase in preventable deaths, and a key factor is a lack of social connectedness and opportunity,” said Minnesota Health Commissioner Jan Malcolm. “Things like job opportunities, good education, and social connection each play a role in the health of individuals, families and communities,” she added. Access to culturally targeted treatment and counseling remains a problem, however, for Native Minnesotans. Most Minnesotans who enter treatment complete it and show considerable improvement, a Health Department briefing paper said. But it often takes 25 days or more to access substance abuse treatment, it added. That is what Fond du Lac, White Earth and other tribes are addressing by opening clinics and treatment programs off reservation in urban centers like Duluth and Minneapolis. There may be more money to support these programs coming through lawsuits. • Purdue Pharma, a manufacturer of OxyContin – a prescription drug accused by health authorities as pushing patients into becoming opioid dependent – agreed to a $270 million settlement on March 26 with the state of Oklahoma. A trial for other manufacturers of the opioid drugs is set to begin in May, the Associated Press reported. • Earlier in March, more than 600 cities, counties and Native tribes from 28 states filed a federal lawsuit against the Sackler family that owns Purdue Pharma LP. The suit alleges the family made a fortune through deceptive marketing of the addictive painkillers, CNN reported. The family and company has denied the allegations. • The UK-based Guardian newspaper, reporting on the same lawsuit filing, identified Cherokee, Chippewa, Sioux, Oneida and Blackfeet tribes as among governmental units bringing the suit. • The Prairie Island Indian Community announced on Aug. 16, 2018 that it had partnered with Minnesota’s three other Dakota tribes in a multi-district lawsuit against opioid prescription drug manufacturers in a suit before a U.S. District Court in Ohio. That announcement, available on the Prairie Island website, also contains information on what the four Dakota tribes are doing to provide counseling and services for its members. Meanwhile, the Bismarck Tribune on May 3 reported that four of North Dakota’s five tribal nations are part of that same suit. In its March 18 announcement of the opioid, alcohol and suicidal deaths in a 2017 report, the Minnesota Department of Health noted several items in Governor Walz’s proposed budget that would help Native organizations and local governments with Native populations deal with the opioid crisis. Among items called for are culturally competent services using traditional American Indian healing, grants to local communities most affected by opioids and suicides, funding for medication-assisted treatment, expanded opioid addiction treatment in correctional facilities, and expanded access to the naloxone drug used to save lives for people experiencing an opioid overdose.